eAlejandro G. Inarritu, the director of the Oscar-winning Birdman resuscitates an old Western sub-genre - the mountain-man movie and gives it a nourish twist of betrayal and revenge. As the trailer proclaims, The Revenant is "inspired by true events", partially based on an episode in the dangerous and brutal life of one of the legendary pioneers of the early 19th Century American north-west. The man was Hugh Glass, one of the most famous mountain-men --frontiersmen - fur traders of the early nineteenth Century north-west America. In 1823 Hugh Glass, a mountain-man, explorer, fur-trader and unreliable raconteur was attacked by a grizzly bear in an isolated part of what is now South Dakota. Glass suffered horrific injuries and his companions abandoned him, apparently convinced that he would die anyway. But Glass eventually crawled / dragged / rafted himself to safety at Fort Kiowa, many miles away. Once he recovered from his many injuries Glass set out to track down those who had abandoned him. Inarritu's movie basically follows this narrative. Some of the best movies of the post-1945 era have involved hazardous river journeys: Werner Herzog's Fitzcarraldo and Aguirre:Wrath of God, John Huston's The African Queen, John Boorman's Deliverance and Francis Coppola's Apocalypse Now. Is The Revenant join this list of movie classics? Director Alejandro G. Inarrritu on location woth Leonardo di Caprio, who plays Hugh Glass. Inarritu insisted on shooting in natural light, favouring dusk. His insistence produced a series of beautiful images of a lonely and hostile landscape. Mountain-manillustration by Frederic Remington.Note the Hawken rifle, famed for its reliability and durability. 1970s movie about bears and the frontier life. Is Hugh Glass the man on the left? 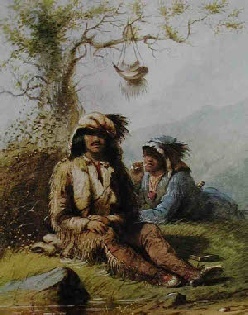 The mountain-men of the American west and north-west have been an object of interest in American popular culture since the early nineteenth Century. They have been depicted in drawings, sketches, novels, movies and tv series. 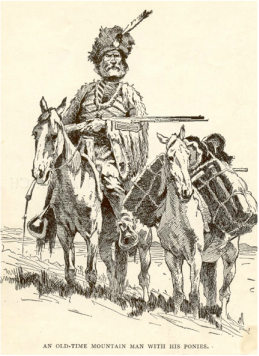 As most of the original mountain-men and their companions were extremely unreliable witnesses, it's difficult to assess the accuracy of accounts of their more hazardous exploits. (Gruesome encounters with ,and incredible escapes from gigantic bears was a favorite subject.) We don't even know what many of these frontiersmen looked like - the image above right purpots to show Hugh Glass with Indian guide, but we can't be sure. Modern depiction of Arikara warrior. The tribe had been seriously weakened by an epidemic in the early 19th Century; later epidemics a couple of decades later weakened the tribe even more. Indian dug-out canoe towing a bullboat, Note a couple of dugouts and three keelboats. 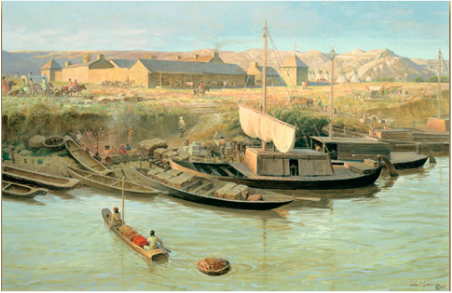 Fort Benton 1855. (John Clymer Estate painting). Such keelboats are depicted in the movie. Canoes, keel-boats and 'Macinaw' boats were essential transport in this rugged area with its many rivers. 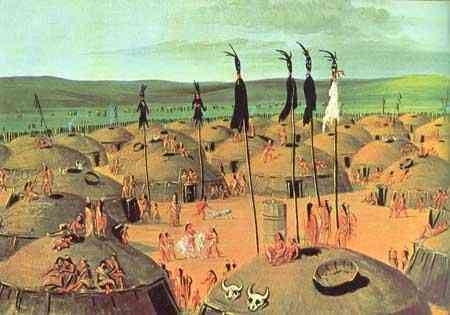 Mandan Indian village (Mandans were fur traders of the upper Missouri region), and also neighbours and rivals of the Arikaras. Traders using a Mackinaw boat. Tales of grizzlies' encounters with mountain-men and traders have been popular since the early 1800s. The Revenant revives what was for decades a favorite Western sub-genre: the Mountain Man -western trader / explorer movie). The early 1950s saw the sadly neglected Howard Hawks' The Big Sky and the epic Clark Gable Across the Wide Missouri. In the early 1970s Robert Redford played Jeremiah Johnson, Charlton Heston and Brian Keith were The Mountain Men. And it also tosses in another durable genre, movies about high adventure along dangerous rivers running through inhospitable and menacing territory. Think Werner Herzog's classic Aguirre Wrath of God, and John Boorman's Deliverance. 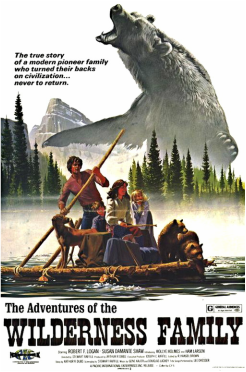 On a rather different level, there's even a grizzly-bear movie genre, including The Life and Times of Grizzly Adams, the pretty good 1976 Grizzly plus the less than convincing The Night of the Grizzly . Not to forget Werner Herzog's fascinating documentary Grizzly Bear, about a man whose obseesive fascination with the animals leads to his violent death.